This map is a showcase which demonstrates 12 different piston extenders. They basically use different redstone configurations in order to extend the push limit for a piston. The max piston extension is 12 blocks and with this map you will be able to learn to make multiple different variants. This map features a relatively small house but with much more to show. There are over 60 redstone creations and together they use more than 500 command blocks. This is by no means your typical house but it’s actually most likely the best and most optimized house you can get for both survival and creative mode. This map includes 20 different redstone creations ranging everywhere from TNT traps to airplanes and TNT cannons. It’s mostly basic redstone structures but nonetheless useful ones. 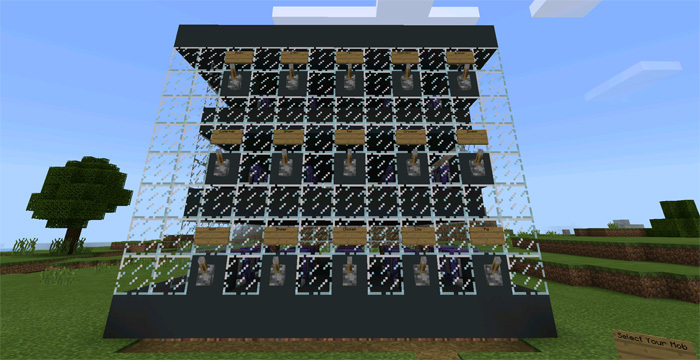 Some of them can only be built in creative mode since they require command blocks but most of them should be possible to build in a survival world. This is a really clever command block machine which you can use to morph into 15 different life forms. All you’ve got to do is to pull a lever and you will in an instant shapeshift into something else. All of it is just a trick though and you aren’t actually another animal, even though it very much looks like it. Pull any of the levers to morph into that animal. It’s all done by command blocks so for it to work it’s necessary that you stay within a certain proximity of the machine. You’ll get an invisibility effect and the mob which you chose will dragged along wherever you walk. This gives the illusion that you have morphed into another life form. 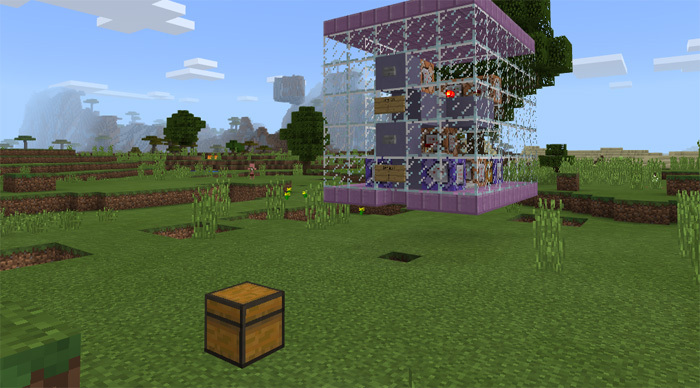 This is a giant fully working crafting table which can be used for crafting most items and blocks. It doesn’t work that much different from an ordinary crafting table except that it is maybe 20 times bigger and is entirely powered by redstone and command blocks. It’s a really cool redstone creation definitely worth checking out. The most interesting part is probably to try to understand how the machine works. First off you will need to decide on an item or block to craft. In this case, I wanted to craft a diamond sword. For that I needed 1 stick and 2 diamonds. Use the buttons on the wall to obtain the necessary items for the crafting recipe. Drop the items according to the crafting recipe on the crafting table. Then step on the “Input” pressure plate and wait for the crafting to process. This might take a little while. This map features 16 different farms for 1.1+ that can be used in a survival world. They all can be built in a world without cheats (You don’t have to use the mob spawners in the mob grinders.) Note that some farms do use gamerules like mobGriefing and doDaylightCycle. Some of the creation involve holding down a button on your mouse and can only be used with the Windows 10 edition. Also note that although it says 15 farms, there are actually 16. (The creator accidentally put 6 twice.) A teleporter was also included to divide the crop & animal farms from the mob grinders. This is a redstone creation which features the new armor sets in version 1.2 in a beautiful animated artwork. It’s basically a display of armor sets wearing different armor. By pressing a button in-game the armor stands will start bouncing up and down similar like a wave. Press the button on the iron block to power the redstone and initiate the wave. It’s a really beautiful thing to see but besides that there is really not much else to do in the map. Colossus is a huge, monstrous machine armed with explosives, missiles and dispensers and it is inspired by Cubehamster’s massive slime creation. It really is a killer machine which once activated has the potential to wipe out much of its surroundings. Let’s just say that you probably never would want to face some of these in a real battle. Use a flint and steel on the side of the observer block in the center of the robot to start the robot and make it start move and shoot. You can stop the robot at any time by placing an obsidian block in front of the horizontal bar shaped lump of slime blocks which are being constantly pulled by the sticky piston which you manually activated when starting the robot. You can remove the obsidian after the machine has stopped. Colossus is a massive two-legged robot which will fire TNT blocks and arrows as it slowly moves forward. You can use the machine to shoot missiles. Find the “Cockpit #2” sign on the platform. Then stand on it and you will find yourself on the weapons cockpit with the view in front. You can only use the missiles while the machine is stopped. Just do what the signs says to make this work in-game. This map features twenty different redstone creations which include a great mix of complexity. However, one thing they have all got in common is that each one is very useful in its own way. Each creation is very easy to examine so it’s a great map if you are a redstone beginner. Check them out in-game and see if there’s any you can find use for in your own worlds. One of the creations is a hidden fireplace and another is a huge massive auto storage machine. Keep your house safe with the Quadrillion Combination Lock. No one (except for maybe explosive creepers) can break inside your house! Do you have a structure with multiple floors? Don’t use stairs! Instead, I recommend that you take the time to implement this elevator. This is a command block creation which adds three items with godly powers. You can only use the items as long you are within a certain area of the machine. But it’s still definitely a pretty cool creation to explore. The items includes a lightning sword, a destroyer pickaxe and a killer axe. Press the start button on the command block machine to enable the God Item features. Then press the Get Items button and obtain the items from the chest. You can activate each weapon’s feature by holding it in your hand.